← 314 "Treehouse of Horror XIV"
The Simpsons sit on the couch as normal, but then begin to decay and turn to dust. My Mother the Carjacker is the second episode of season 15. The episode aired on November 9, 2003. The episode was written by Michael Price and directed by Nancy Kruse. 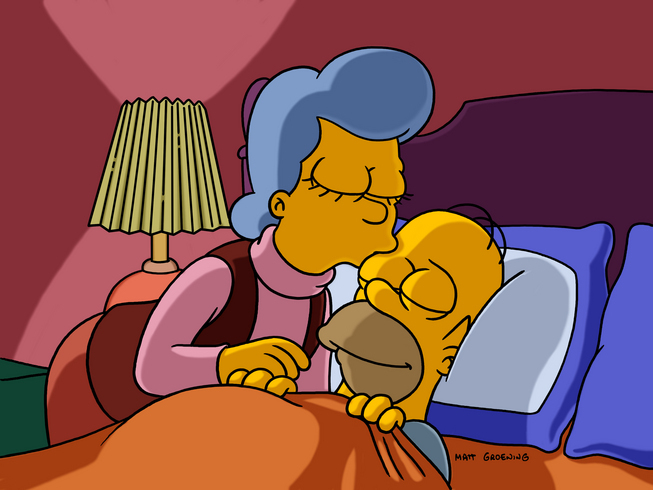 Glenn Close reprised her role as Homer's mother, Mona Simpson. "Homer's mother returns and, after being cleared of all charges, is re-imprisoned on a technicality." Homer, Lisa, Bart and Maggie are cleaning the garden, when Marge orders to them to go inside. After finally getting Homer indoors, the family sit and watch the TV. On Kent Brockman's "Oops Patrol", it's revealed Marge discovered a funny headline and she's rewarded with an "Oops Patrol " shirt. Homer gets jealous of the shirt and strives to win one for himself. Homer spends the next evening searching for funny headlines in his bedroom. He discovers a interesting article called: "The World's Biggest Pizza". The first lines of the article spells Homer and he wakes Marge and tells her someone is trying to communicate with him. He discovers it's today's newspaper and he wakes Bart so they can go together. Upon arriving at Four Street Overpass, the mystery person arrives scaring Bart and Homer. She reveals herself to be Mona Simpson and puts a sweater on Bart, which says: "World's Best Grandson". At the Overpass Diner, she apologizes for being mysterious, but she had to be cautious because the government is after for her for destroying Mr. Burns' germ lab in the 1960s. She used her links with the Springfield newspaper company to communicate with Homer, using the story of the giant pizza to lure him. Bart questions why Mona returned and she reveals it was because of the macaroni pencil holder Homer made when he was five. Chief Wiggum, Lou and Eddie arrive at the diner. Mona is recognized by Lou and she, Homer and Bart flee the diner. While in the car, Homer vows not to let the cops get Mona again, but he crashes into the police station, and Mona is arrested. During Mona's court case, Mr Burns tries to get Mona put on trial but she is released, to Homer's delight. Mona catches up on Homer's childhood; bathing him, watching him in the school play, knitting for him, teaching him to ride a bike, and watching a re-enactment of the birth of Bart. In Moe's Tavern, Mona catches up with Lenny and Carl. Mr. Burns renames his Germ Lab to "Grandma Simpson Peace Museum and Kid-teractive Learnatorium". He asks Mona to be the first to sign the visitor book, but as she signs she mentions she used fake names in the visitor books of theme parks; which is a federal offense. The FBI jump out and arrest Mona, which deeply saddens Homer. Homer reminisces his time with Mona and decides to break her out of prison. The following day, Bart and Homer break onto the bus transferring the prisoners to jail. Homer steals the bus and all of the prisoners (except Mona) get off. The police give chase to the bus and Mona pushes Homer out of the bus onto a bed, which rolls into some large cacti. The bus nears a cliff with the police in hot pursuit, Homer watches in despair as the bus flies of the cliff and lands in a large lake which is covered by an avalanche. At Mona's funeral, the coffin is lost and Homer kicks over Frank Grimes' grave. Homer decides to see if his mother communicated with him again. He eventually finds a, article which reads: "IMOK". He goes to sleep and it's revealed he mislooked at an article about a giant taco, which reveals Mona escaped from the bus and is fine. Modified on July 15, 2017, at 07:17.